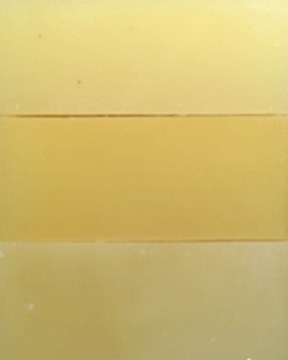 Our Shea Butter Soap Trio includes three of our super-moisturizing Facial soaps made with Shea butter, cocoa butter, comfrey-infused olive oil, but no ground herbs - as in our Hand Repair recipe - that can be too scratchy on thinner facial skin, especially those who don't like exfoliants. Our three Shea Butter Soap Trio scents include Lavender, Dewberry, and Grapefruit & Bergamot. This Soap Trio Gift iincludes three full size soap bars individually wrapped in colorful, coordinating paper cigar bands over corrugating cardboard and stacked inside a clear, cellophane bag, tied with matching color raffia. A gold foil product label identities the soaps inside the soap gift.